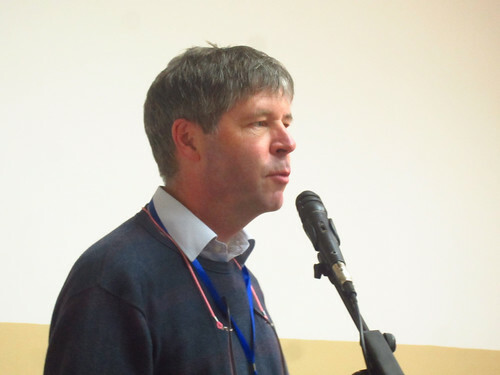 Alan Duncan works at the International Livestock Research Institute (ILRI) as a livestock scientist. He was born in Edinburgh, Scotland and studied zoology (BSc) at Aberdeen University and animal nutrition (PhD) at Edinburgh University. Duncan is highly involved in the Africa RISING project in the Ethiopian highlands, where he provides support for the livestock feeds and innovation systems work. He has been involved in Africa RISING since the development of the proposal. In his current position he generates ideas for research and comments on research ideas from the project team. For Duncan, Africa RISING is unique because it takes a proactive approach to systems research and designs processes that encourage systems thinking. The project is multi-disciplinary and multi-centre and it places a strong emphasis on practical interventions but attempts to develop ideas for interventions in a participatory way, by for example, emphasizing multi-stakeholder processes and farmer participation, and it takes account of systems synergies and trade-offs. Duncan desires to see strong, holistic interventions that benefit farmers and to see systems approaches and Africa RISING ideas being taken up by development programs. He thinks the major challenge in the project is its complexity, especially in managing partner relationships. Tags: africa rising, Alan Duncan, interview, portrait, RISING voices. Bookmark the permalink.